Schmid, M. A., Kauffman, E., Payne, A., Harris, E. and Kramer, L. D. (2017). Preparation of Mosquito Salivary Gland Extract and Intradermal Inoculation of Mice. Bio-protocol 7(14): e2407. DOI: 10.21769/BioProtoc.2407. Mosquito-transmitted pathogens are among the leading causes of severe disease and death in humans. Components within the saliva of mosquito vectors facilitate blood feeding, modulate host responses, and allow efficient transmission of pathogens, such as Dengue, Zika, yellow fever, West Nile, Japanese encephalitis, and chikungunya viruses, as well as Plasmodium parasites, among others. Here, we describe standardized methods to assess the impact of mosquito-derived factors on immune responses and pathogenesis in mouse models of infection. This protocol includes the generation of mosquito salivary gland extracts and intradermal inoculation of mouse ears. Ultimately, the information obtained from using these techniques can help reveal fundamental mechanisms of interaction between pathogens, mosquito vectors, and the mammalian host. In addition, this protocol can help establish improved infection challenge models for pre-clinical testing of vaccines or therapeutics that take into account the natural route of transmission via mosquitoes. While probing for blood, the mosquito inoculates saliva that facilitates feeding but can also contain pathogens, if the mosquito has previously fed on an infected individual. Mosquito saliva plays an important role in establishing infection, facilitating dissemination, modulating immune responses, and exacerbating pathogenesis during West Nile virus (Schneider et al., 2006; Styer et al., 2011), Dengue virus (Cox et al., 2012; Conway et al., 2014; McCracken et al., 2014; Schmid et al., 2016), chikungunya virus (Agarwal et al., 2016), Semliki Forest virus (Pingen et al., 2016), Rift Valley Fever virus (Le Coupanec et al., 2013) and Plasmodium parasite (Schneider et al., 2011) infection. Many important questions yet remain and call for improved animal models. Whereas inoculation via infected mosquitoes best mimics natural transmission, high variability in the inoculated dose and limited availability of insectary facilities result in restricted use of such procedures. In addition, the amount of saliva and the presence or absence of mosquito-derived components cannot be controlled when using infected mosquitoes. As an alternative, ‘spot feeding’ of uninfected female mosquitoes followed by intradermal inoculation of the pathogen via a needle mimics the natural deposition of saliva into mouse skin and delivers a defined dose of pathogen. The ‘spot feeding’ model has successfully been used to study Dengue virus (Cox et al., 2012; McCracken et al., 2014) and West Nile virus (Moser et al., 2015) infection but still requires the concomitant use of live mosquitoes and mice, and cannot control for the amount of saliva delivered. To separately control for mosquito and mouse experiments, inserting the mosquito proboscis into a sucrose solution in a capillary tube can serve to collect mosquito saliva artificially. The saliva collected during sugar feeding, however, differs qualitatively from mosquito saliva that is inoculated into the host skin during natural blood feeding (Marinotti et al., 1990; Moser et al., 2015). Here, we describe the use of a simplified model of needle-inoculating mosquito salivary gland extract (SGE) from non-infected mosquitoes that can be delivered with a pathogen in a controlled manner at a defined dose. 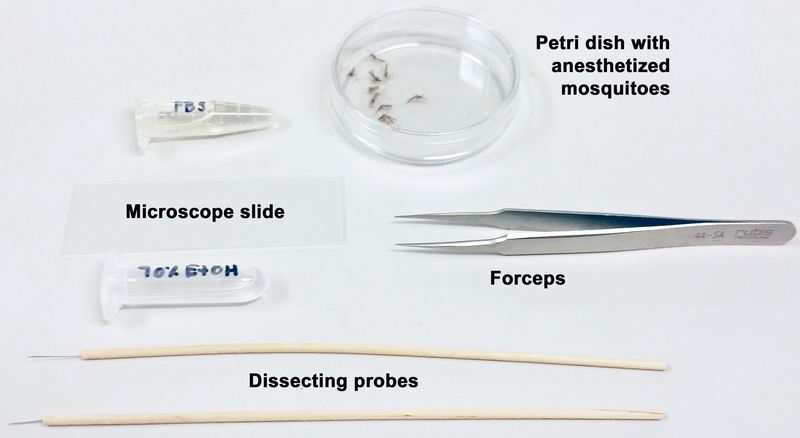 This method allows for independent handling of live mosquitoes and mice between collaborators and can more easily be standardized between assays and research groups. Use of SGE has proven useful to study infection with West Nile virus (Schneider et al., 2006; Moser et al., 2015), Dengue virus (Conway et al., 2014; Schmid et al., 2016), Rift Valley fever virus (Le Coupanec et al., 2013), and Sindbis virus (Schneider et al., 2004). Injection of SGE does not precisely mimic inoculation via the mosquito proboscis and likely contains non-secreted components of salivary glands. Nevertheless, this method allows collection of higher quantities of mosquito-derived factors, contains all secreted proteins, and can also be used in in vitro assays. Overall, the procedures described here should facilitate collaboration between entomologists, immunologists, and researchers studying pathogens of interest. Note: For the rearing of mosquitoes and general maintenance of a mosquito colony, see Bio-protocol Kauffman et al. (2017). Note: Alternative needles: use with disposable hypodermic needle, e.g., 30 G x 1 inch (BD, catalog number: 305128 ). Note: Dissecting probes are fabricated from 15-cm wooden applicators and insect pins. Soak the applicator sticks in hot water for at least 30 min, and cut the heads off the pins and discard. Using plyers, hold the pin, avoiding damage to the pointy end, and push the blunt (cut) end into the stick. Let the probe dry. Manufacturer: Medco Instruments, catalog number: S17328C . Note: It is important that the flat parts of the forceps touch each other over the entire surface. If the opposing surfaces touch at only one point, the ear skin is more likely to generate folds when inserting the needle. Manufacturer: Emerson Electric, BRANSON, model: Model 450 . Manufacturer: Emerson Electric, BRANSON, catalog number: 109-116-1760 . Manufacturer: Emerson Electric, BRANSON, catalog number: 101-063-275 . Note: Alternative syringe: Reusable glass microinjection syringe model 702 LT (Luer tip), SYR, NDL sold separately, no needle, volume 25 µl (Hamilton, catalog number: 80401 ). 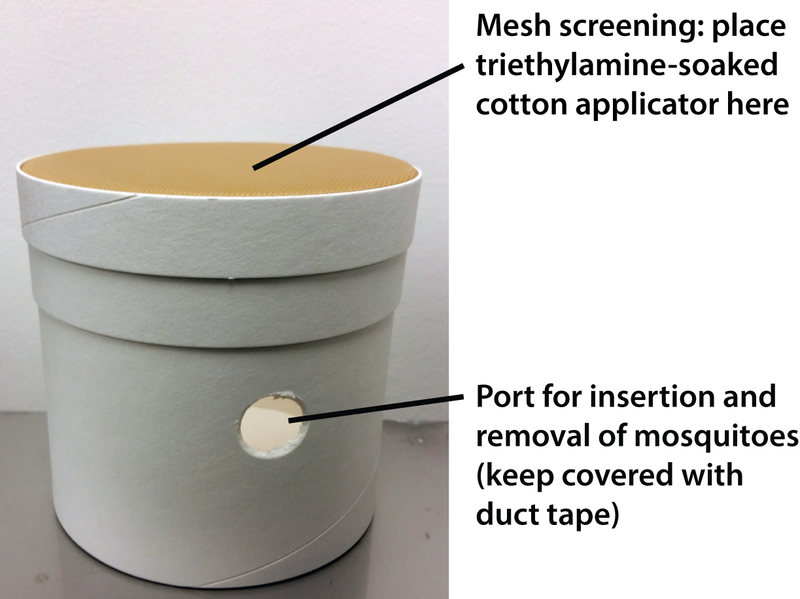 Anesthetize mosquitoes by resting a cotton swab applicator moistened with triethylamine on the mesh lid of the mosquito holding carton; cover with plastic wrap or Petri dish to contain the triethylamine (Figure 2). Once the mosquitoes are anesthetized, transfer them to a Petri dish and cover. Remove a female from the dish using Superfine tip forceps and dip into a microcentrifuge tube containing 70% ethanol to sterilize the body surface (Figure 3). Place a drop (approximately 50 µl) of PBS on a microscope slide using a transfer pipet and spread the drop around. Place the slide on the stage of the dissecting microscope. Remove the legs of the mosquito, then place the body on its side in the PBS (see Video 1). Remove the tip of the abdomen with a sharp cut from the dissecting probe; do not pull. Place one dissecting probe on the thorax of the mosquito and the other between the head and the thorax. Apply gentle pressure to the thorax, then slowly remove the head by gently pulling away from the thorax (Figure 4 and Video 1). 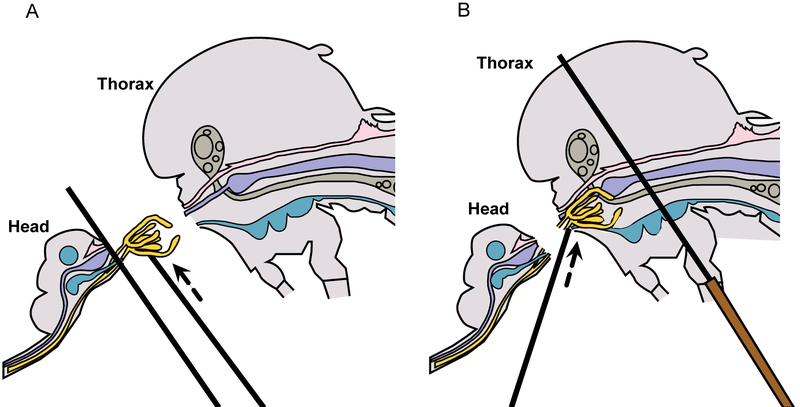 The salivary glands will be apparent, if they remain with the head and may be removed by lifting them up and away from the head with the probe, while holding one probe between the glands and the head (Figure 5A and Video 1). 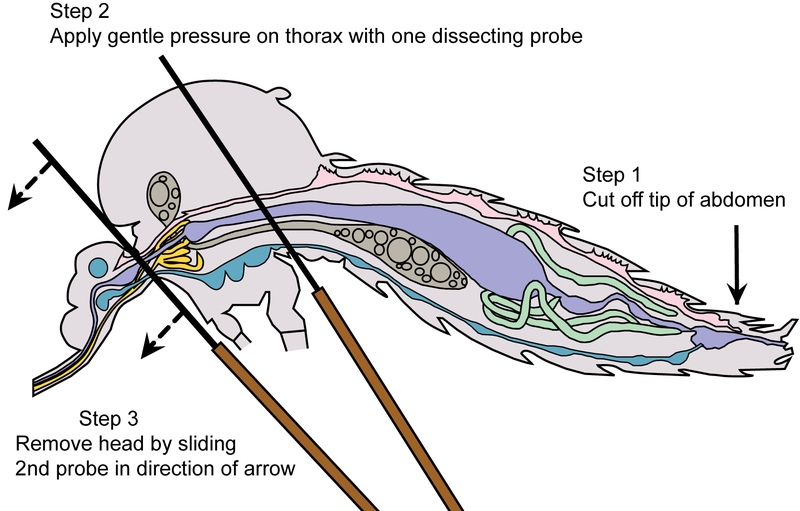 If the glands remain within the thorax, apply gentle pressure with one probe held flat against the thorax and use the other probe to locate and gently tease out the glands (Figure 5B and Video 1). Figure 5. 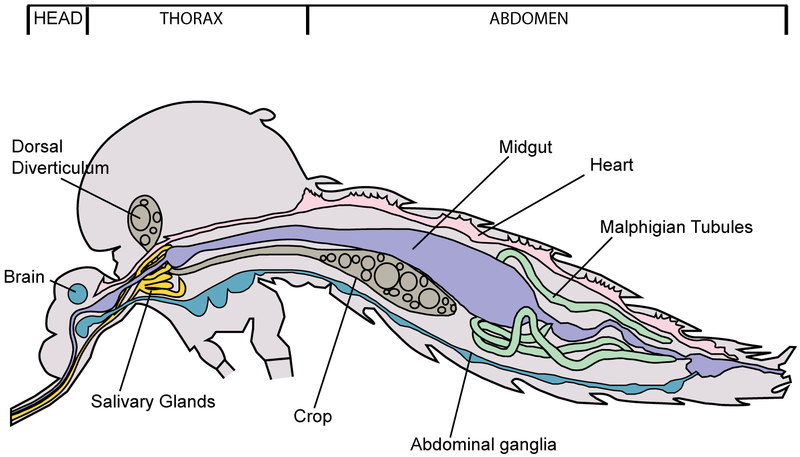 Mosquito diagram: removal of salivary glands. A. Lift salivary glands up & away from head; B. Tease salivary glands from thorax. Once the glands are removed, place an additional two drops of fresh PBS separately on the slide, near but not touching the initial drop, and carefully rinse the glands by drawing them sequentially through the PBS drops (Figure 6). Place one pair of salivary glands in 10 µl of PBS, pooling up to 50 pairs in a volume of 500 µl. Because mosquitoes inoculate volumes < 5 µl while probing for blood vessels, one may choose to prepare SGE at a higher concentration (using lower volumes of PBS) for later being able to reduce the volume of intradermal inoculation. Store at -20 °C until ready to prepare the SGE. Remove frozen glands and thaw quickly at 37 °C. Add water and ice chips to the horn of the sonicator. Place a microfuge tube containing salivary glands into the floating microtube rack. Program the sonicator with the following parameters: 100 mV, 3 bursts of 20 sec, 1 min cooling between bursts. Centrifuge at 5,000 x g at 4 °C for 10 min. Remove the supernatant to a fresh microcentrifuge tube. Determine the protein concentration of the SGE using the Micro BCA Protein Assay Kit, following the manufacturer’s microplate procedure. The typical amount of protein obtained per one pair of salivary gland is 0.8-1.2 µg, which we obtained in a volume of 10 µl PBS. Use pH strips to test pH of SGE stocks, which should be neutral pH of 7.0 due to the buffering capacity of PBS. In the case that the pH is not neutral, interpretation of the data should take this into account. On the one hand, pH may be an intrinsic property of saliva from the used vector species. On the other hand, differences in pH may change infectivity and transmission of a virus or another pathogen used in the experiments. Confirm that SGE stock is free of endotoxin or contains very low levels that are well below the FDA-approved limit for injection solutions (< 5 endotoxin units per kg per hour), as tested using the endpoint chromogenic Limulus Amebocyte Lysate kit (Lonza) and 10 µl SGE stock, which corresponds to approximately 1 µg of protein. If endotoxin levels are high, the SGE preparation should be discarded because observed effects cannot clearly be attributed to components of the SGE or the presence of endotoxin. Dilute the SGE in sterile PBS in a 1.5-ml tube. Adjust concentration to contain the extract of 0.2 to 1 salivary gland (each mosquito has one pair of salivary glands) per 20 µl PBS. If testing the effect of SGE on arbovirus infection, mix SGE with a concentrated virus stock of e.g., DENV (104-106 plaque forming units, see [Schmid and Harris, 2014; Schmid et al., 2016]). Use virus diluted in PBS as control for the absence of mosquito saliva. As further controls, use non-injected (untouched) ears or intradermal inoculation of PBS alone. If titers of the virus and SGE stock solutions are high enough, it may be beneficial to inoculate a total volume of less than 20 µl because mosquitoes typically inoculate < 5 µl. For a 20 µl injection, take up a total of 25 µl of the salivary gland extract into the glass syringe, while excluding air bubbles. Avoid touching the surface of the tube to avoid blunting of the tip of the reusable needle. In the meantime, anesthetize mice via inhalation of 2-4% isoflurane in a stream of 2 L/min oxygen. Adjust inhalation time and percent isoflurane until the mouse breathes approximately once per second. After removing from the anesthesia, the mouse will still be anesthetized for approximately one minute, to allow the intradermal inoculation. Note: Anesthesia of mice via isoflurane inhalation must be performed by trained laboratory personnel. 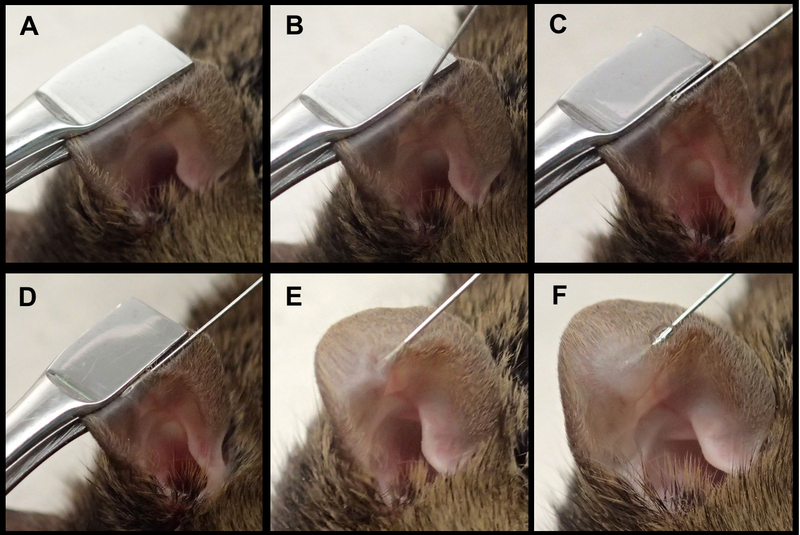 Immobilize one ear of an anesthetized mouse using cover slip forceps so that the ventral part of the ear faces up. The bottom of the forceps should end approximately in the center of the ear at the site of injection. Tilt the ear backwards and remove folds within the ear skin (Figure 8A). Note: Make sure that the ear skin is dry prior to injection in order to avoid sticking of the ear to the forceps. If necessary, dry the skin with tissue or gauze. See also Video 2, Intradermal Inoculation. Force the part of the forceps that faces up towards the top and the part at the dorsal side of the ear (facing away) towards the bottom. Thus forming a ‘bench’ or ‘ledge’ will provide a solid support for the injection site (Figure 8A). Hold the needle with the bevel pointing up. Approach the ‘ledge’ with the need held at a ~45° angle and gently penetrate the surface of the skin (Figure 8B). Drop the 45° angle of the needle until it is parallel to the forceps and skin, while precisely maintaining the position of the tip of the needle. Being then parallel to the skin, one should feel the support of the forceps along the length of the needle (Figure 8C). Insert the needle ~3 mm while moving parallel to the surface within the skin tissue. One should feel substantial resistance and continuously see the bevel of the needle through the surface of the skin (Figure 8D). If the resistance suddenly decreases or the bevel can no longer be seen, the needle may have poked through the back of the skin (if this occurs, start a second attempt after removing the forceps and needle). Carefully let go of the forceps without moving the ear skin relative to the needle (Figure 8E). Move the hand that held the forceps over the other hand to reach the plunger of the syringe. Slowly inoculate 20 µl of solution and monitor the appearance of a small blister underneath the skin (Figure 8F). Successful injection leads to a transient stiffening of the ear (induced by the small blister), and some resistance should be felt while injecting. If no blister develops or no stiffening occurs, the inoculum may have leaked through the back of the ear. If this occurs, remove the needle and reinsert at a slightly different site of the ear. If a small amount of inoculum leaks through the front or back of the skin, compensate this volume with the extra 5 µl that have been taken up into the syringe to ensure injection of exactly 20 µl. If the inoculated volume is still < 20 µl, inoculate more at a different site of the same ear skin. After inoculation, hold the side of the ear (not where the blister has formed) with the forceps and slowly remove the needle. Note: Start using a new needle once initial puncture of the skin becomes more difficult (every 6-10 experiments). Throughout the procedure, closely monitor the breathing of the anesthetized mouse. Also, monitor the mice regularly during and after waking up from anesthesia. After use, clean the glass syringe by flushing several times with Bleach or other disinfectant, followed by PBS and then 70% ethanol. For reusing the glass syringes, designate one syringe per reagent (e.g., SGE alone, virus alone, SGE + virus, PBS alone) to avoid cross-contamination. The glass syringes and needles can also be autoclaved. Figure 9. Intradermal inoculation of SGE induces vascular leak into the skin and exacerbates Dengue disease in a mouse model of infection. A. Wild-type mice were inoculated intravenously with dextran that was labeled with Alexa Fluor 680. Immediately thereafter, 15 µl SGE or PBS was inoculated intradermally. After 30 min, mice were euthanized, and ears were scanned using the Odyssey CLx Infrared Imaging System (Licor). Representative scan showing fluorescence that leaked with plasma into the skin at sites of intradermal inoculation or corresponding areas in steady-state ears (white circles). B. Mice deficient in the interferon-α/β receptor (Ifnar-/-) were inoculated intradermally with 105 plaque forming units of Dengue virus-2 strain D220 in the absence or presence of enhancing antibodies (5 µg of monoclonal antibody 4G2, targeting Dengue virus E protein) to model antibody-dependent enhancement (ADE). Dengue virus was inoculated alone or after mixing with Ae. aegypti SGE (+SGE). Kaplan-Meier curves showing survival of mice. Data were pooled from three experiments. Statistically significant differences were tested between the presence and absence of SGE using the Log-rank (Mantel-Cox) test and are marked as ** for P < 0.01. All experiments using mice were performed with approval of and strictly followed the guidelines of the Animal Care and Use Committee of the University of California, Berkeley, USA (AUP-2014-08-6638) and the Ethical Committee of the University of Leuven, Belgium (P140-2016). The development and use of this protocol at University of California, Berkeley was supported by the US National Institute of Allergy and Infectious Diseases, National Institutes of Health grant R01 AI085607 (EH) and the German Research Foundation (Deutsche Forschungsgemeinschaft), research fellowship SCHM 3011/1-1 (MAS). We would like to thank Johan Neyts and Kai Dallmeier for support, Ruben Pholien for technical assistance, and the KU Leuven Rega Foundation for a postdoctoral fellowship (MAS). The original work of the laboratory at KU Leuven was supported by the IVAP-project of the Belgian Society of Virology (BELVIR) from the Belgian Federal Science Policy Office (Belspo). This protocol was originally established to generate the primary data in Schmid et al., 2016 and was briefly described therein. Agarwal, A., Joshi, G., Nagar, D. P., Sharma, A. K., Sukumaran, D., Pant, S. C., Parida, M. M. and Dash, P. K. (2016). Mosquito saliva induced cutaneous events augment Chikungunya virus replication and disease progression. Infect Genet Evol 40: 126-135. Conway, M. J., Watson, A. M., Colpitts, T. M., Dragovic, S. M., Li, Z., Wang, P., Feitosa, F., Shepherd, D. T., Ryman, K. D., Klimstra, W. B., Anderson, J. F. and Fikrig, E. (2014). Mosquito saliva serine protease enhances dissemination of Dengue virus into the mammalian host. J Virol 88(1): 164-175. Cox, J., Mota, J., Sukupolvi-Petty, S., Diamond, M. S. and Rico-Hesse, R. (2012). Mosquito bite delivery of Dengue virus enhances immunogenicity and pathogenesis in humanized mice. J Virol 86(14): 7637-7649. Kauffman, E., Payne, A.; Franke, M. A., Schmid, M. A., Schmid, E. and Kramer, L. D. (2017). Rearing of Culex spp. and Aedes spp. mosquitoes. Bio Protoc 7(17): e2542. Le Coupanec, A., Babin, D., Fiette, L., Jouvion, G., Ave, P., Misse, D., Bouloy, M. and Choumet, V. (2013). Aedes mosquito saliva modulates Rift Valley fever virus pathogenicity. PLoS Negl Trop Dis 7(6): e2237. Marinotti, O., James, A. A. and Ribeiro, J. (1990). Diet and salivation in female Aedes aegypti mosquitoes. J Insect Physiol 36(8): 545-548. McCracken, M. K., Christofferson, R. C., Chisenhall, D. M. and Mores, C. N. (2014). Analysis of early dengue virus infection in mice as modulated by Aedes aegypti probing. J Virol 88(4): 1881-1889. Moser, L. A., Lim, P. Y., Styer, L. M., Kramer, L. D. and Bernard, K. A. (2015). Parameters of Mosquito-enhanced West Nile virus infection. J Virol 90(1): 292-299. Pingen, M., Bryden, S. R., Pondeville, E., Schnettler, E., Kohl, A., Merits, A., Fazakerley, J. K., Graham, G. J. and McKimmie, C. S. (2016). Host inflammatory response to mosquito bites enhances the severity of arbovirus infection. Immunity 44(6): 1455-1469. Schmid, M. A., Glasner, D. R., Shah, S., Michlmayr, D., Kramer, L. D. and Harris, E. (2016). Mosquito saliva increases endothelial permeability in the skin, immune cell migration, and dengue pathogenesis during antibody-dependent enhancement. PLoS Pathog 12(6): e1005676. Schmid, M. A. and Harris, E. (2014). Monocyte recruitment to the dermis and differentiation to dendritic cells increases the targets for dengue virus replication. PLoS Pathog 10(12): e1004541. Schneider, B. S., Mathieu, C., Peronet, R. and Mecheri, S. (2011). Anopheles stephensi saliva enhances progression of cerebral malaria in a murine model. Vector Borne Zoonotic Dis 11(4): 423-432. Schneider, B. S., Soong, L., Girard, Y. A., Campbell, G., Mason, P. and Higgs, S. (2006). Potentiation of West Nile encephalitis by mosquito feeding. Viral Immunol 19(1): 74-82. Schneider, B. S., Soong, L., Zeidner, N. S. and Higgs, S. (2004). Aedes aegypti salivary gland extracts modulate anti-viral and TH1/TH2 cytokine responses to sindbis virus infection. Viral Immunol 17(4): 565-73. Styer, L. M., Lim, P. Y., Louie, K. L., Albright, R. G., Kramer, L. D. and Bernard, K. A. (2011). Mosquito saliva causes enhancement of West Nile virus infection in mice. J Virol 85(4): 1517-1527. How to cite: Schmid, M. A., Kauffman, E., Payne, A., Harris, E. and Kramer, L. D. (2017). Preparation of Mosquito Salivary Gland Extract and Intradermal Inoculation of Mice. Bio-protocol 7(14): e2407. DOI: 10.21769/BioProtoc.2407. We sought this protocol to learn how to do intradermal inoculation of the mouse ear, not mosquito salivary gland dissection. The protocol is very clear and detailed but the technique is challenging, so we were unable to reproducibly deliver 20ul to the ear dermis. I think we could learn this technique with substantial practice but it is very demanding for the novice. I completely agree that the intradermal inoculation is challenging and requires regular practice. A key challenge I found was that the ear may have several punctures after a few attempts, leading to leakage of the inoculated solution. Decreasing the injection volume to 5-10 µl may help. A colleague follows a similar protocol by attaching the ear skin to a double-sided, sticky tape for the injection (not requiring forceps). Despite potentially being easier, the subsequent "tape stripping" may induce dendritic cell migration, which was a key readout for us. Alternatively, one could inoculate the dorsal skin of the mouse back intradermally. Nevertheless, this procedure requires shaving and dehairing of the skin, which also induces irritation and does not guarantee steady-state conditions prior to inoculation. For these reasons, we decided to perform the procedure as described in the protocol.